Napa, where the wine is bottled poetry. We have to agree. Yesterday was a total veg day watching football and relaxing after the 1,900 miles driving along the Oregon coast and in and out of the state’s interior. 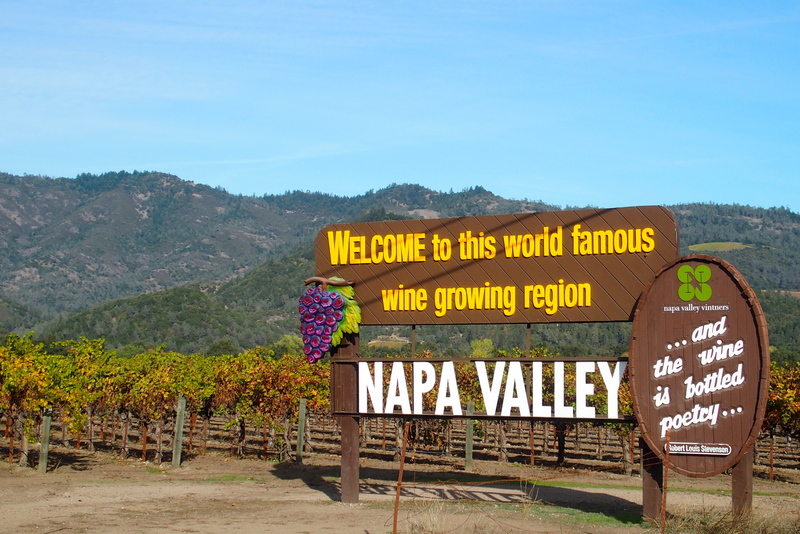 Today we had to get busy on our wine goal, so we visited three wineries in Napa. 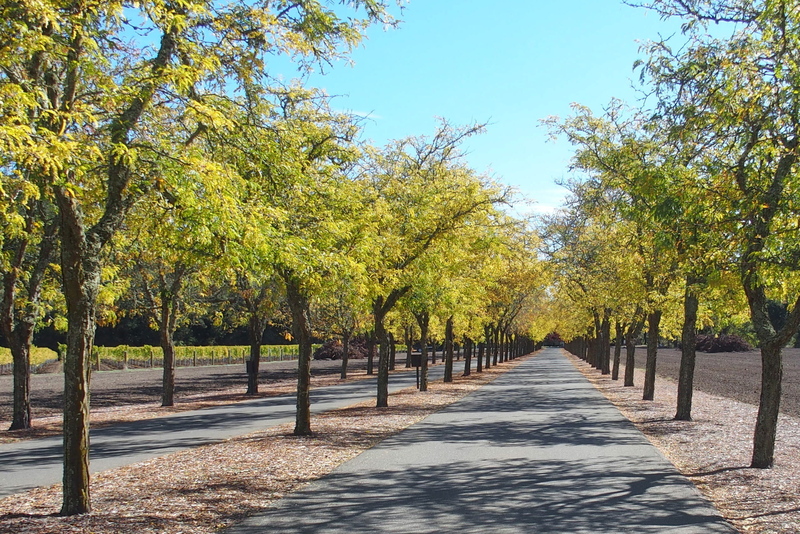 The first was Beaulieu Vineyard, the name meaning “beautiful place.” It was founded in the early 1900s by the Frenchman Georges de Latour (not to be confused with the French Baroque painter, Georges de la Tour). 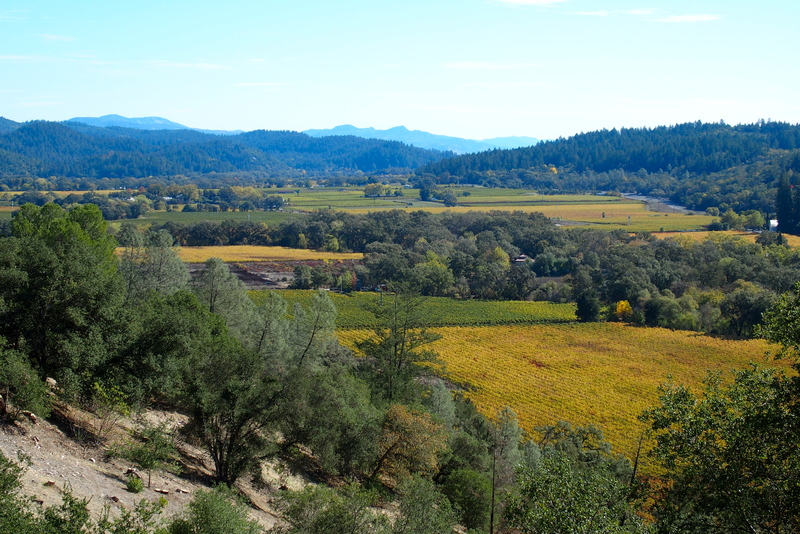 Our visit was to the tasting room, not the vineyard, so we didn’t see just how beautiful these specific vineyards were, but the wine was quite nice. 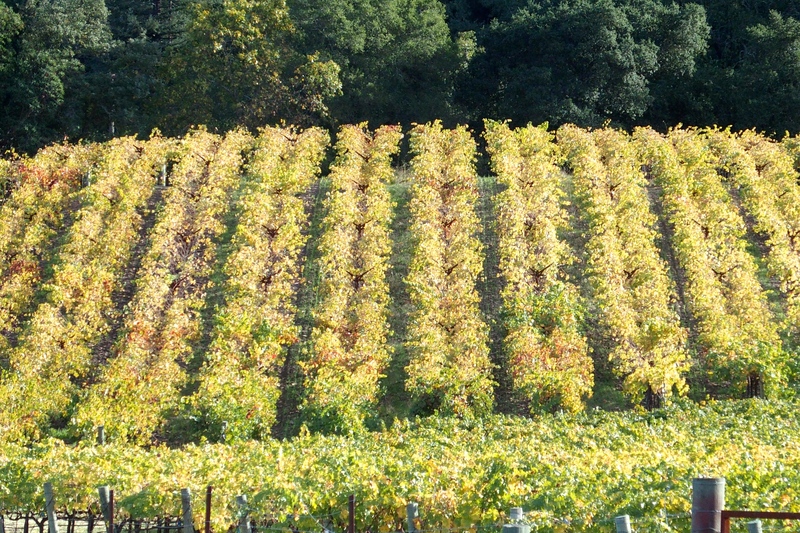 This might have been a Beaulieu vineyard. It’s rather hard to tell since every square inch of space in the valley seems to be covered with grapes for one winery or another. Or this might have been Beaulieu. How do you tell them apart? Then we went to Sterling. 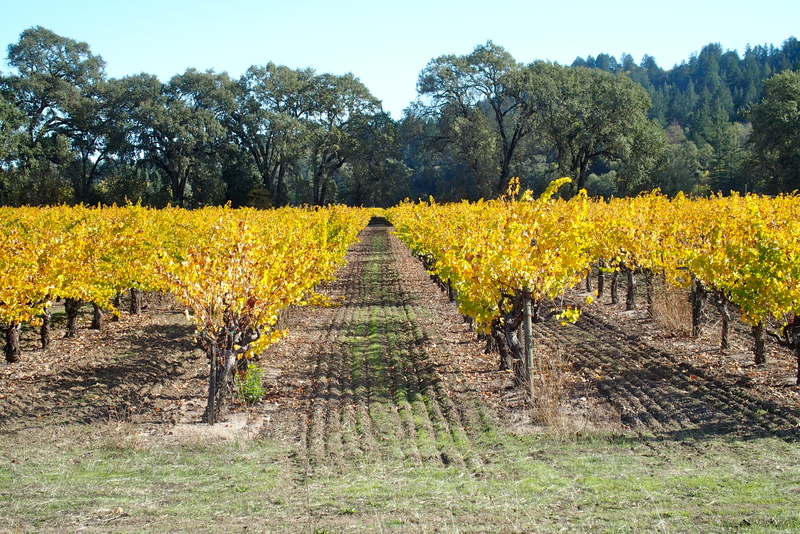 The wines don’t have quite the reputation as some others in Napa and Sonoma, but the tour experience is unique. The long driveway into the place is inviting. Setting the stage for a delightful experience. 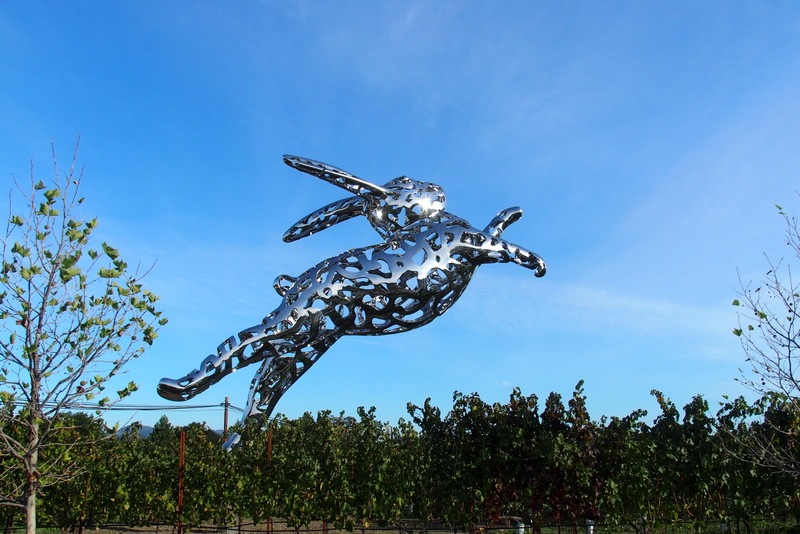 Every winery has to have something unique to stand out from the crowd. Sterling stands up on a tall hill. To get to Sterling’s tasting you have to take a cable car ride. It’s only four minutes long, but it goes 90 feet in the air to a large Greek-design winery on a hill. Like a ski lift without snow. The view from Sterling’s cable car on the way to the fortress 300 feet above the valley. The tasting is actually a self-guided walking tour with bottle stations and a few bits of information as you walk past the processing areas. 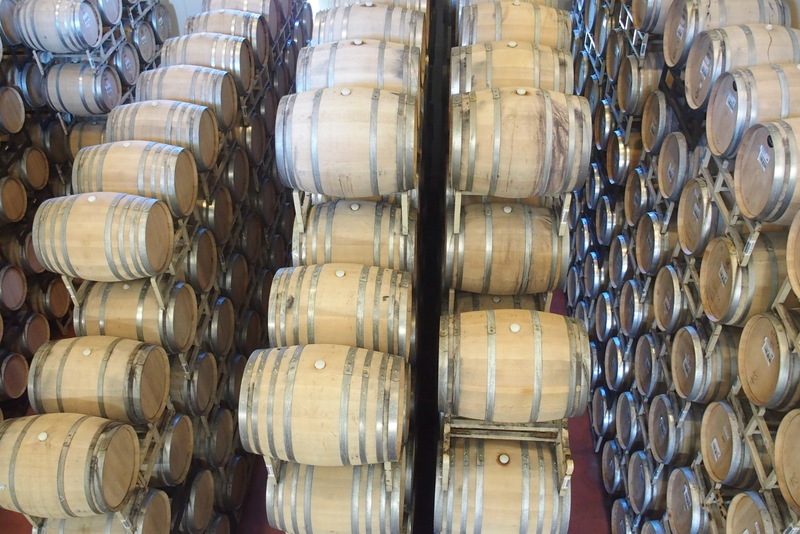 Lots of wine being “oaked” in barrels. Aromatic with a bit of oak and slightly musty wine smells. 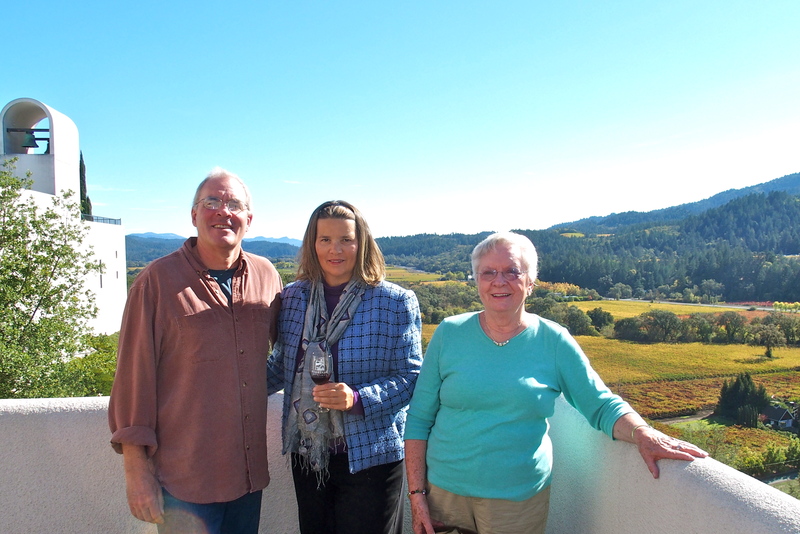 Finally, we ended up on Sterling’s large terrace where we looked out over vineyards up and down the valley as far as the eye could see, which was not necessarily all that far given all the wine we were drinking. 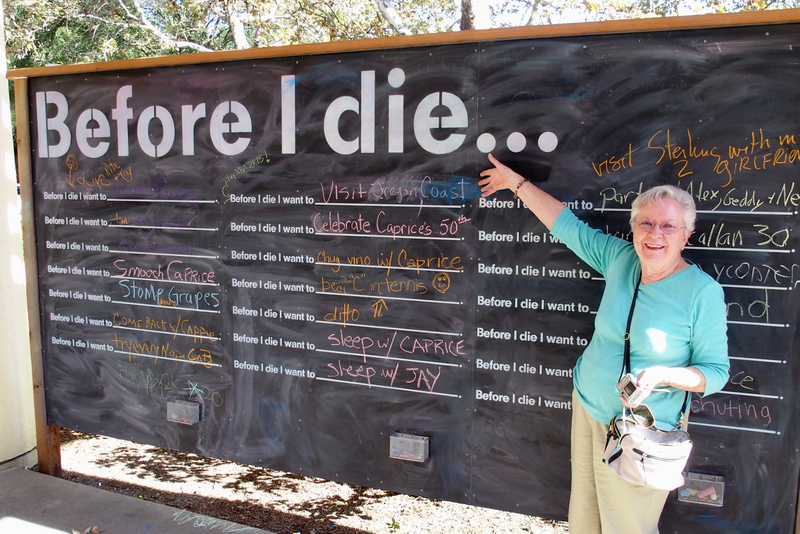 As we left the winery, we made our mark on the “Before I Die” board. Read Marcia’s goal: Visit the Oregon Coast. DONE! The biggie on our visit today was Robert Mondavi, a name that we recognized from wines readily available on the shelves of Harris Teeter (grocery) back in Charlotte. While we sat on their spacious patio sipping our Pinot Noir, a large corporate group came in to do the full tour and tasting. Thirty cell phones snapping selfies with the statue in the courtyard. 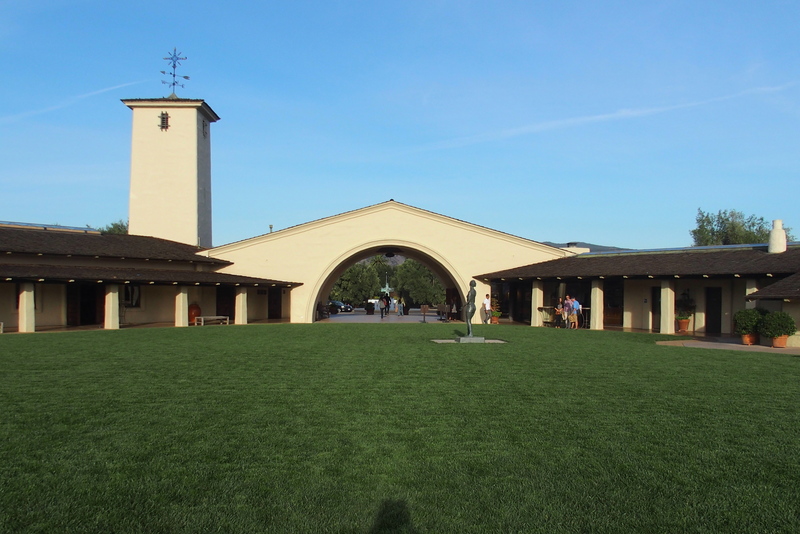 Mondavi’s HUGE lawn for tasting and entertaining. A great spot for a wedding. Speaking of weddings, our daughter and her boyfriend have just gotten engaged on their trip to Greece. Very exciting! The wedding is likely to be back at Keuka Lake in New York’s Finger Lakes wine country next summer. The gigantic Hall hopping Bunny Foo Foo. They even provide an “X marks the spot” instruction for where to stand to get the best photo. 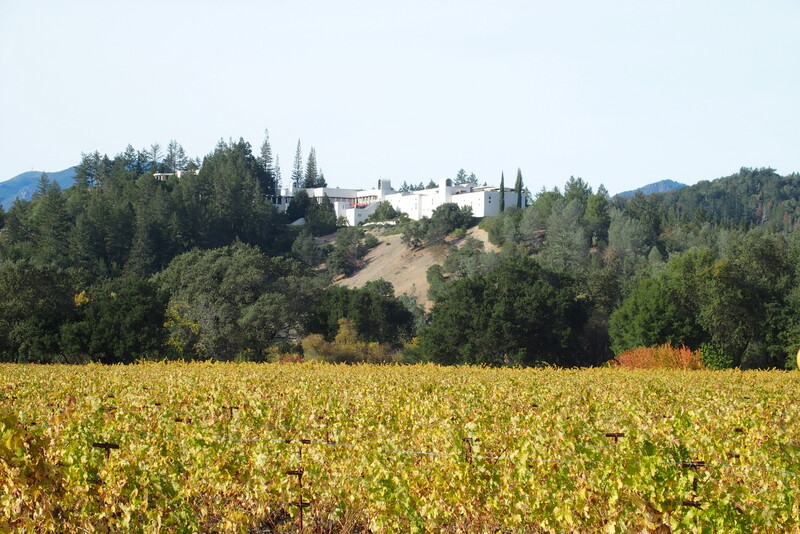 This entry was posted in Travel Journal and tagged Beaulieu Winery, California, Hall Winery, Napa, Robert Mondavi Winery, Sterling Winery, wine, wineries. Bookmark the permalink. I certainly am enjoying your trip! Perhaps even more than you, because I don’t have to drive! Joán, we have traveled almost 10,000 miles and Michael has done ALL the driving! Lucky me! Congrats on the upcoming wedding! Please send my regards to Elizabeth. Can’t wait for your next installment!